Scientific molding takes the typical plastics injection molding process to the next level by developing structured studies and methods to characterize a particular plastics process or polymer. It is, quite literally, applying science and statistics to the process of melting, forming, and cooling a mass of molten plastic into a desired shape. The behavior of polymers is, in fact, very complex and requires hundreds of machine settings, numbers, and protocols. Fortunately for us, all these numbers, settings, and intrinsic properties of various polymers can be summed up into just four main variables; Heat, Pressure, Flow Rate, and Cooling Rate. This is the power of scientific injection molding, the ability to navigate through some of the very complex inner workings of the rheology (study of complex flow) of polymers and the non-Newtonian type behavior seen with them. 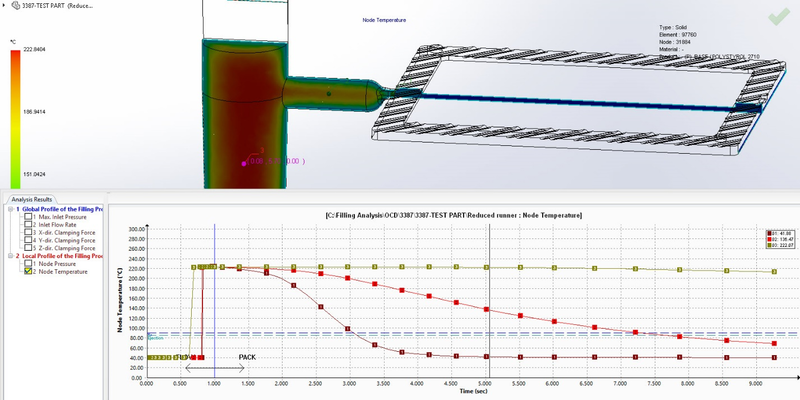 Developing viscosity curves, performing gate freeze studies, pack & hold pressure studies, cure time studies, full dimensional analysis in tandem with 3D files pulled directly from our CAD software laid out in a professional excel report are just some of the steps we take here at HARBEC in order to constantly apply and reap the benefits of scientific molding. Knowledge is power and in the case of manufacturing plastic parts, scientific molding brings knowledge to the table through defined methods of establishing scientific processes, use of advanced analytical software such as Moldflow Simulation, Minitab Statistical Analysis, and precision inspection to apply six-sigma techniques across the board.